Velveeta Cheese Dip is my go to recipe when having a naughty snack craving. 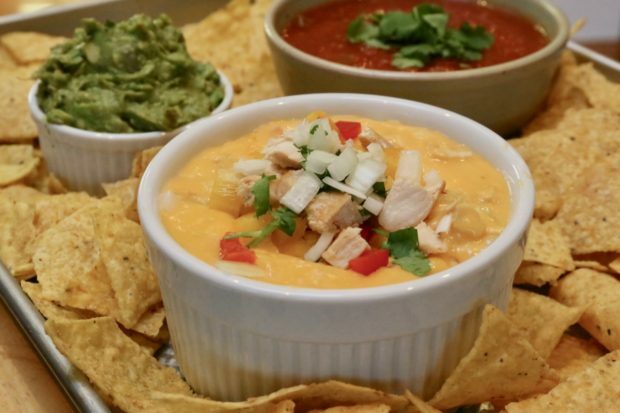 If you order nachos with liquid cheese instead of buttered popcorn at the theatre you’ll love these Mexican Queso recipes. 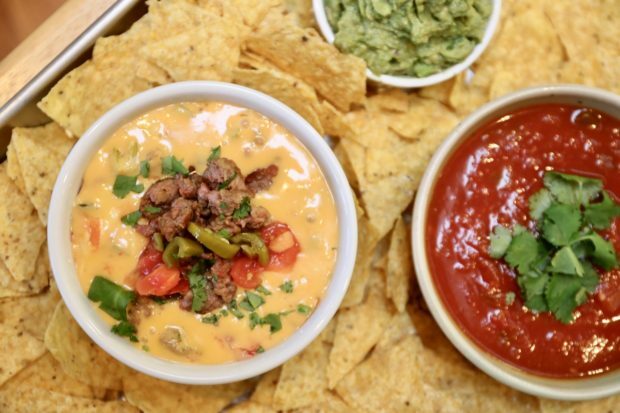 Once you’ve mastered our classic Velveeta Cheese Dip, get creative by testing out recipes for Spicy Sausage Velveeta Cheese Dip, Fajita Velveeta Cheese Dip, and Loaded Cowboy Velveeta Cheese Dip. Velveeta Cheese is a brand name for a processed cheese product that tastes like an American cheese. It has a softer and smoother texture than cheese and as a result, when melted, it keeps a fully integrated and evenly clump-free liquid texture. 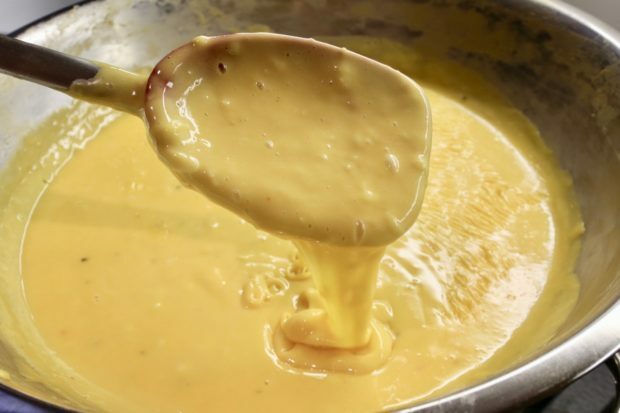 Using Velveeta Cheese when preparing Mexican Queso gives it the smooth consistency you’re looking for. Originally Velveeta was made from real cheese. Today, Velveeta is mainly made up of whey protein concentrate, milk protein concentrate, milk, fat and preservatives. Velveeta Cheese was invented in 1918 by Emil Frey of the Monroe Cheese Company in New York. The product was created in an attempt to salvage its Swiss cheese wheels that were either broken or misshapen. In 1923, The Velveeta Cheese Company was incorporated as a separate company, and sold to Kraft Foods in 1927. When Kraft debuted pre-sliced cheese in the ’50s, it had to do damage control. To avoid competition between its own brands, Kraft rebranded Velveeta as a dip and sauce. 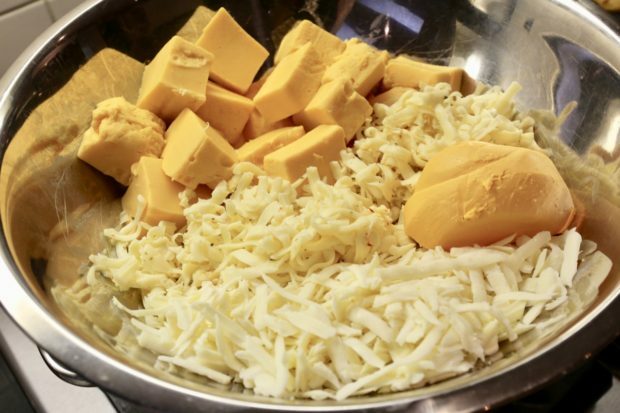 Velveeta Queso ingredients heating over a double boiler. The marketing masters at Kraft Foods have created hundreds of recipes for Velveeta Cheese. Velvetta Cheese Dip: our favourite way to enjoy the product is by dipping nachos into a spicy Mexican Queso. Grilled Cheese: Velveeta Cheese placed between two slices of bread and fried on a griddle makes for America’s most iconic sandwich. Mac & Cheese: Velveeta’s smooth consistency makes for a great cheese sauce when in a rush to get dinner on the table. Baked Potato: it’s the perfect creamy cheese sauce to smother over a loaded potato. Your Velveeta Dip is finished once it runs smoothly off a spoon. I could honestly eat Velveeta Queso Dip every day for lunch. It’s that addictive. Velveeta Cheese Dip is a gluten-free recipe. When served with nachos it’s the perfect appetizer to bring to a Celiac friendly dinner party. Because this nacho dip recipe is so easy to make last minute, it’s my go-to whenever I’m hosting a big party. Last Minute Dinner Invitation: if you’ve been invited to a dinner party last minute, Velveeta Dip is the perfect go-to recipe. It takes no more than 15 minutes to prepare! Potluck Party: I love going to potluck parties because it allows me to get a taste of the creative culinary minds of my friends. There’s no better way to impress than serving a finger-licking-good Velveeta Dip. 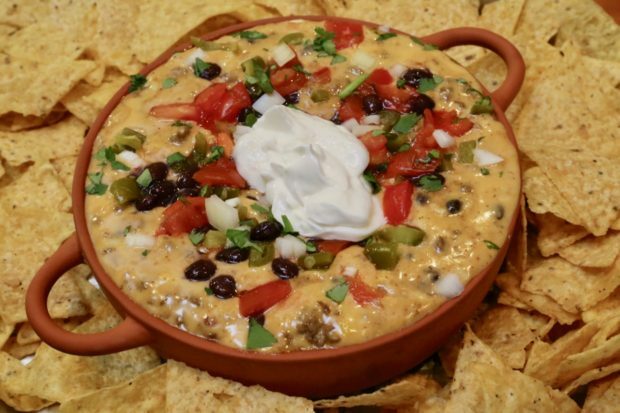 Game Night: Velveeta Queso Dip is one of the most popular recipes to serve at super bowl parties. Nachos dipped in creamy cheese pairs perfectly with your favourite craft beer. 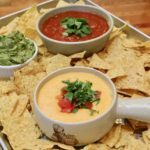 Special Celebrations: our Velveeta Queso recipe is the perfect addition to your next New Years Eve celebration, birthday party or Cinco de Mayo feast. I also love serving Mexican Queso at the cottage in the summer. It’s the perfect mid-afternoon snack to enjoy on the dock. 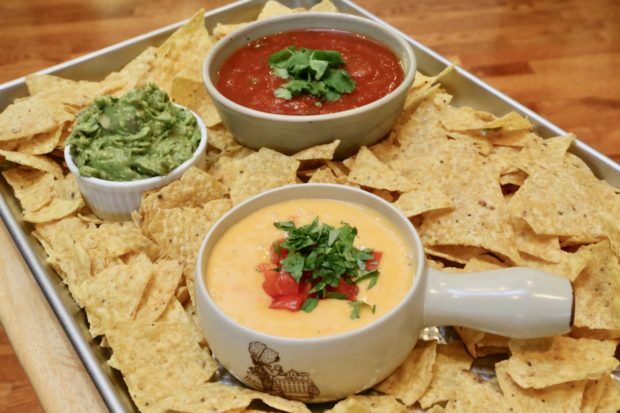 Classic Velveeta Cheese Dip served with nachos, salsa and guacamole. Standard Velveeta Dip recipes include just three ingredients: Velveeta Cheese, diced tomatoes and pickled jalapeños. After doing extensive recipe testing we crafted a Velveeta Queso recipe that includes a medley of cheeses. When the cheeses are combined together they make mouthes water. My Mexican Queso features Velveeta, Oaxacan Queso, Jalapeno Havarti and Kraft Imperial Cheese. If you have leftover Velveeta Cheese Dip you can store it in the fridge for up to a week. Simply reheat in the microwave and stir well before eating. Add ingredients to a double boiler and turn on medium high heat over your stove. Alternatively, you can prepare in the microwave but be sure to stir regularly to ensure smooth consistency. Once the Velveeta dip has fully incorporated into a smooth sauce immediately serve with nachos, salsa and guacamole. Spicy Sausage Velveeta Cheese Dip offers a nice kick! 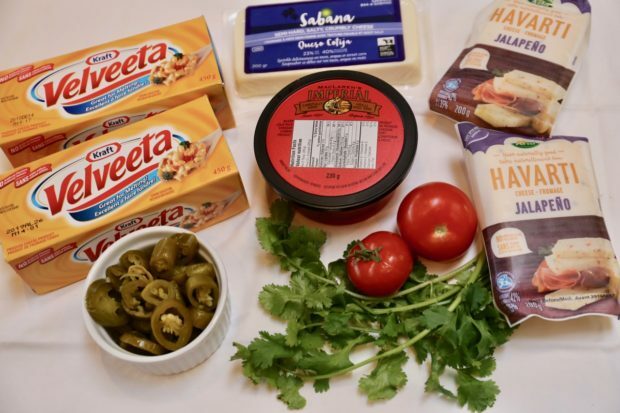 Once you’ve mastered our classic Velveeta Queso, get creative by adding other ingredients inspired by your favourite Tex Mex dishes. Prepare our classic Mexican Queso and once melted into a smooth consistency add 1/2 lb fried pork sausage. Before serving top with diced tomatoes, pickled jalapeños and cilantro. Fajita Velveeta Cheese Dip is a great way to use up leftover chicken in your fridge. Prepare our classic Mexican Queso until it’s melted into a smooth consistency. Add one diced cooked chicken breast, 1/4 cup finely chopped sweet peppers, and small onion. This is a great way to use up day old roast chicken, fried chicken, or BBQ chicken. The Loaded Cowboy is our favourite Mexican Queso. Serve your Loaded Cowboy by topping it with a dollop of sour cream.